Los Angeles, CA, September 18, 2018 --(PR.com)-- Luis Iga’s ground-breaking Latinx feature film, "Murder in the Woods," makes its San Diego premiere at the FANtastic Horror Film Festival. The film stars José Julián (“A Better Life”) and features distinguished actor Danny Trejo (“Machete”). 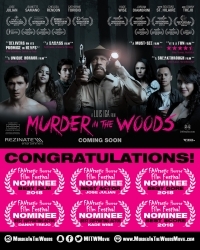 "Murder in the Woods" has a total of six nominations at the prestigious festival. The nominations are Best Feature Film, Best Actor: Jose Julian, Best Supporting Actor: Kade Wise & Danny Trejo, Best Score and Goriest Film. “Murder in the Woods" is a production of REZINATE Entertainment, founded by Luis Iga. REZINATE partnered up with Yelyna De Leon to produce this film. Both graduated with an MFA in Film and Television Production from the School of Cinematic Arts at the University of Southern California (USC) where they met.